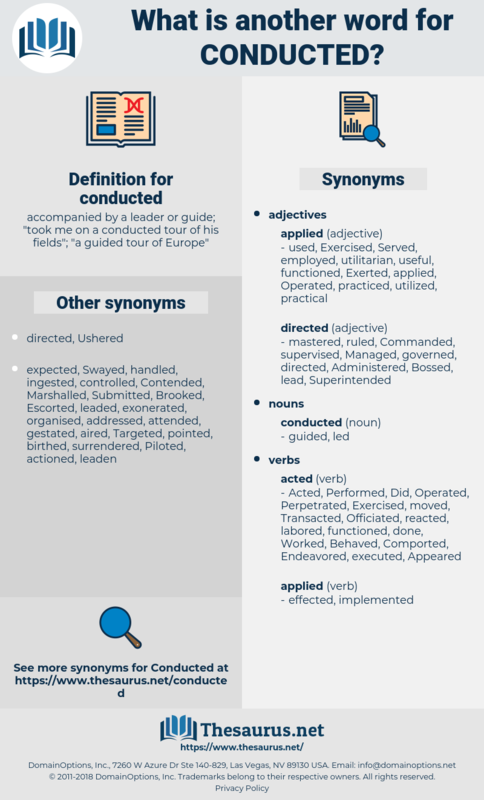 What is another word for conducted? 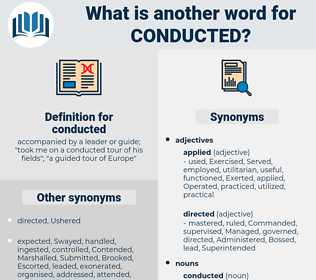 accompanied by a leader or guide; " took me on a conducted tour of his fields"; " a guided tour of Europe"
entrepreneurs, corporations, begins, ventures, events, Inquiries, Carriers, conducting, done, Undertaken, implemented, executed. investigations, Respondents, Studies, interventions, Tests, Efforts, Surveys, actions, initiatives, strengths, purchases, Undertaken. constituted, concluded, collected, Contended, investigation, instructed, contracted, Investigated, continued, Introduced, committed, transactions, Administered, considered, co-organized, Contributed, concentrated, co-hosted, Inspected, collaborated, Cooperated, Commended, supervision, contained, Containing, inspection, demonstrated, action, evaluated, Prosecuted, organise, organised, organize, Organizing, Commanded, purpose, endeavoured, courses, commissioned, Participated, Commemorated, Enacted, Existed, ascertained, Consisted, sustained, determined, Operated, Organizations, Underwent, surveillance, Upheld, orchestrated, Carried, supervised, recommended, directorate, Exercised, investigative, Discussed, reproduced, encouraged, Came, Explored, guaranteed, Occurred, Examined, Convoked, Oversaw, subject, Officiated, allocated, Instigated, conforming, organization, Audited, Competed, appointed, arranged, engaged, maintain, maintained, Maintaining, adopted, identified, mount, development, courts, practiced, studied, structured, attended, conveyed, observed, monitor, monitoring, monitored, Managed, recorded, Stood, established, Establishing, donated, mounted, Indicated, practised, accordance, understood, extended, oversight, submission, Questioned, formation, concerned, curated, facilitated, Effectuated, Petitioned, Presided, inquiry, Began, pursued, unfold, unfolded, Declined, method, published, relation, sent, honoured, suggested, Assessed, included, interviewed, Forwarded, Embarked, Wrote, intended, Followed, pointed, Studies, dispensed, reported, decreased, ended, dispatched, Behaved, Generated, appreciated, opened, Mentioned, described, Accounted, reviewed, moved, check, checked, Caught, Drafted, built, retained, imposed, hailed, verified, informed, covered, follow-up, dedicated, Created, measured, Promoted, Flew, surrendered, Steered, recognized, Applauded, Volunteered, Procured, handled, entrusted, celebrated, received, spearheaded, Supplemented, recherche, respectively, experienced, processed, Surveyed, Voted, host, hosted, fulfilled, supported, presented, involved, Entered, designed, Instituted, Succeeded, spent, spoke, driving, drove, Worked, noted, ordered, all, enlivened, invested, part, guiding, Became, amended, acquitted, ensured, who, also, moderated, assumed, scheduled, Deposited, revised, pilot, Piloted, search, Searched, adapted, centred, licensed, Ensued, ruled, needed, elaborated, planned, traveled, travelled, calculated, started, erupted, inspired, Reimbursed, finalized, Prompted, valued, tested, taught, running, Ran, applicable, Evolved, transmitted, treated, sought, crossed, Pushed, Attacked, welcomed, earned, experts, Resulted, applied, Raided, derived, edited, secured, Displayed, training, drew, landed, research, found, triggered, focused, focussed, insured, mandated, Referred, learned, traded, Served, staged, sponsored, tracked, Wore, granted, sparked, Filed, opposed, Enabled, formed, estimated, shot, Threw, Allowed, Returned, Visited, Arrived, dropped, Exported, Talked, Urged, funded, Gained, required, licence, Supplied, Delegated, Pioneered, Caused, laid, Awarded, placed, posed, charged, Offered, Argued, Remained, benefit, Benefited, unleashed, Fielded, hired, highlighted, Looked, permit, permitted, Sailed, evening, related, Relating, reassured, bearing, Stayed, Captured, Levied, Did, Doing, DO, signed, treaty, Aimed, branch, rose, night, Went, Yielded, goal, Rated, Relied, Dealt, left, forced, Levelled, briefed, tabled, Happened, day, tried, Reached, sealed, Lived, raised, wages, Waged, modeled, Bought, headed, filled, assured, broke, marked, played, Shipped, Tasked, changed, released, Helped, posted, attempted, chair, Chaired, Asked, called, expressed, Targeted, saw, thought, revealed, read, won, Wished, heard, dreamed, requested, Passed, stated, pulled, Lasted, Rowed, fired, party, Claimed, Classes, expert, Appealed, Killed, Had, keep, kept, wanted, figured, Meant, dated, Got, based, 'il, making, proceed, Proceeded, events, perform, performing, Performed, fulfil, led, executed, achieve. Constructed, conclusions, concluded, collected, consolidated, Consulted, consultation, investigation, conditioned, contracted, Investigated, continued, coordinated, Introduced, committed, Administered, communication, considered, co-organized, Conduced, Contributed, co-sponsored, concentrated, detected, Inspected, Cooperated, Discriminated, corrected, Communicated, conceived, actioned, outcome, contained, demonstrated, deducted, documented, action, evaluated, Prosecuted, organised, Commanded, Inflicted, confirmed, Undergone, selected, Negotiated, Intervened, Counted, endeavoured, commissioned, Transacted, Participated, Commemorated, Enacted, ascertained, Consisted, complemented, quantitated, sustained, determined, cooperation, enforced, Operated, conquered, Organizations, Populations, interrogated, reconsidered, Upheld, distributed, protected, redirected, composed, Collated, Carried, supervised, acknowledged, compliance, Disseminated, governed, Exercised, cultivated, departments, Discussed, Encountered, Compiled, reproduced, encouraged, compliant, discovered, Explored, Accommodated, guaranteed, authorized, Combated, Occurred, Examined, yes, incorporated, substantiated, Obtained, Necessitated, Subjected, regulated, Overseen, stopped, audit, Auditing, Officiated, allocated, disaggregated, located, Attracted, Audited, controlled, manufactured, devoted, educated, appointed, arranged, engaged, maintained, adopted, transposed, Complied, outsourced, identified, Perpetrated, affected, reflected, disclosed, Denominated, authorised, practiced, characterized, studied, structured, occupied, attended, compelled, elected, observed, monitoring, monitored, Managed, organizsed, recorded, Stood, represented, decided, expanded, quantified, established, donated, mounted, owned, Indicated, outlined, projected, practised, touched, circulated, understood, designated, extended, gathered, respected, Questioned, Begun, Enjoyed, concerned, curated, facilitated, Effectuated, Comprised, postponed, Presided, incidence, Culminated, inquiry, persecuted, pursued, Hanged, unfolded, Detained, acquired, Declined, combined, recovered, inscribed, invited, published, sent, Interviews, withheld, dominated, honoured, Analyses, analysed, Escorted, suggested, Assessed, Solemnized, broadcast, included, destined, written, characterised, interviewed, Materialized, Forwarded, expected, enforceable, dictated, nominated, Embarked, Responded, pronounced, mitigation, Exerted, Compared, rescheduled, Debated, outreach, L, accompanied, opening, assigned, intended, validated, Followed, pointed, Studies, dispensed, Influenced, analyzed, reported, decreased, ended, prescribed, announced, dispatched, Generated, adjusted, induced, withdrawn, appreciated, redeployed, opened, Recruited, reconciled, enhanced, formulated, Mentioned, described, declared, activated, analysis, Accounted, reviewed, moved, drilled, disposed, safeguarded, anticipated, justified, Endured, provoked, attained, checked, campaigns, Caught, chosen, Drafted, built, retained, imposed, Progressed, centered, verified, solicited, Adhered, calibrated, positioned, despatched, Flown, terminated, region, informed, removed, covered, certified, follow-up, dedicated, Created, measured, reunited, Promoted, Afforded, compressed, accepted, embodied, Steered, utilized, Transported, founded, recognized, Replicated, reduced, Procured, handled, motivated, entrusted, Beautified, received, spearheaded, mediated, Supplemented, experienced, carved, processed, Surveyed, Devolved, Tackled, spoken, hosted, fulfilled, supported, proposed, Appraised, presented, involved, Entered, drive, driven, exchanged, designed, Been, Explained, Instituted, Succeeded, spent, approved, excused, exposed, oriented, resistance, Mobilized, Worked, routed, Obeyed, detailed, noted, assembled, guided, Cited, ordered, invented, proved, proven, furnished, Devised, become, Preceded, invested, painted, Regarded, ground, animated, discharged, amended, fostered, Purchased, Translated, Disbursed, acquitted, expended, Screened, grown, ensured, Resumed, moderated, Notified, assumed, rule, scheduled, Deposited, Approached, burnt, warranted, revised, Piloted, search, Searched, witnessed, centred, employed, licensed, associated, Installed, cast, ruled, test, Curricula, needed, elaborated, planned, cleaned, travelled, resolved, calculated, started, Accorded, imported, sown, erupted, inspired, settled, exploited, finalized, Prompted, valued, tested, situated, taught, ambassador, Evolved, transmitted, treated, Deemed, sought, crossed, Judged, Resorted, Pushed, welcomed, earned, experts, enrolled, curbed, tapped, Shown, trained, Resulted, drawn, applied, Raided, derived, edited, secured, repeated, dressed, artwork, Displayed, Enshrined, found, murdered, absolved, Scored, triggered, focused, focussed, fed, implanted, on-going, insured, mandated, Referred, learned, traded, language, Served, absorbed, thrown, sponsored, obligated, Emerged, tracked, preserved, solved, granted, divided, Imparted, pledged, Engineered, Filed, opposed, Enabled, saved, lent, planted, formed, estimated, shot, Tempted, Emitted, staffed, unfurled, Allowed, Returned, Boosted, Arisen, Visited, Arrived, Rented, financed, seized, dropped, Exported, attached, Urged, accrued, funded, Waived, Gained, struck, accessed, faced, required, shaped, worn, Supplied, Delegated, framework, Exempted, Caused, laid, Awarded, harnessed, placed, crewed, posed, known, charged, Prevailed, preformed, forecast, agreed, Channelled, finalised, Offered, Sued, Viewed, serviced, added, Argued, specified, Remained, Benefited, Harvested, Fielded, i.e., Picked, born, Borne, smoked, hired, highlighted, desired, foreseen, Looked, halted, permitted, tagged, related, Lodged, reassured, credited, relieved, elapsed, Stayed, risen, Switched, fuelled, suited, bound, grouped, spread, type, Transferred, gone, Told, vested, ridden, signed, blocked, Aimed, sworn, booked, subsumed, handed, Programs, programmed, Yielded, registered, boned, obliged, Dragged, Rated, leased, Dealt, left, forced, arrested, Levelled, tabled, Happened, fish, Assayed, tried, Reached, Lived, phased, raised, Waged, filmed, heated, locked, Bought, fallen, headed, inclined, filled, assured, listed, satisfied, priced, geared, marked, lifted, played, given, limited, cut, Shipped, Tasked, failed, changed, promised, released, Replied, Helped, posted, linked, forfeited, offset, fixed, attempted, Chaired, Asked, missed, called, cleared, seen, expressed, Targeted, levered, expired, shared, Mapped, sampled, thought, sold, said, revealed, Piped, won, Wished, heard, Fitted, requested, Passed, Earmarked, stated, Spared, Lasted, fired, 2002, 2005, mined, Answered, Claimed, seated, have, Has, Appealed, powered, Killed, Had, backed, kept, Numbered, Meant, Gotten, dated, Got, based, shed, named, proceed, Proceeded, Performed, done, Undertaken, implemented, led. escape, hold, carry, exercise, proceed, perform, accomplish, fulfil, realize, achieve, attain. Without him, the tests of the Prescott aeroplane could hardly be conducted. The meeting between these loving friends of monikinity and of knowledge, was conducted on the most approved principles of reason.